The Far Side; is there a better side????? Registering happily along through the stack of goodies, I hear someone behind my back mention Jane Goodall. No surprise to me, since we are at the jane Goodall Institute's office. 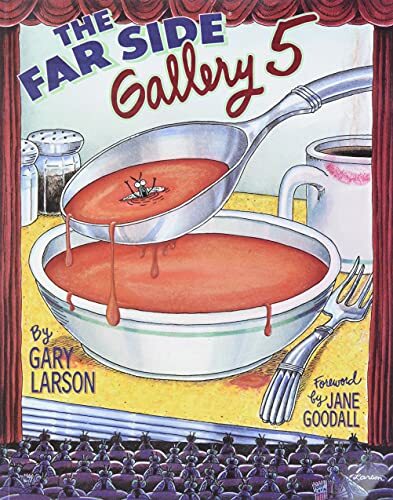 But look, this Gary Larson comic book has a foreword by jane Goodall herself! My, I didn't know about that! The cartoon to go along with it pictures two chimpanzees in a tree, one grooming the other and commenting: "Well well, another blond hair.... conducting a little more 'research' with that Jane Goodall tramp again?" I remember at our Global meeting, of the international Jane Goodall Institute, in Montreal, where our Canadian colleagues handed out T-shirts with this cartoon. But now we have the real foreword! I mean, on our virtual bookshelf. i will make a copy of it for our files at the office. This one goes back to E-mile, via Powerhouse. Thank you!